Druxton Bridge | Launceston Then! Durkeston Brugge or Druxton Bridge as it is known today, dates from around 1370. The bridge is made up of four arches. It not only separates Cornwall and Devon, but is also the border of the parishes of St. Giles on the Heath and Werrington. In John Neales book ‘Discovering the Tamar,’ he tells the story from the fourteenth century, of a tithing man from Boyton, in who complained that Boleputte Bridge (Bullapitt Bridge), over the Tala Water, near where it joins the Tamar, was in a poor state of repair and was dangerous. Fearing a tragedy, he approached the Prior of Launceston and requested that the bridge be made safe. Contemporary writing tells us that the prior was somewhat irritated by the request and the unexpected expense that was likely to fall on his foundation. He obviously took the cost into account and he declined to pay for the work. The tithing man was equally strong-willed and was not going to be fobbed off. He brought the matter to the Hundred Court of Black Torrington. The sheriff afterwards ordered the bailiff to form a jury and to hold an inquest into the dispute. 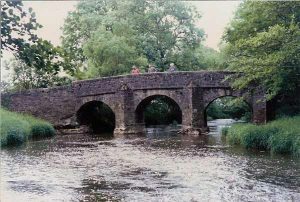 Druxton Bridge was deemed to be the most suitable place to conduct the proceedings, so on the appointed day the sheriff duly heard all the evidence for and against the claim. After mush deliberation he eventually came down firmly on the side of the prior and absolved him and his foundation from any responsibility for the upkeep of Bullapit Bridge.